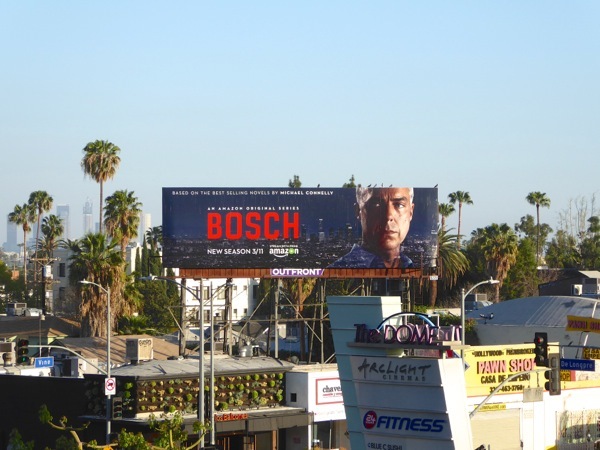 Anyone who knows Michael Connelly's 'Harry Bosch' knows he has one of the most enviable window views in Hollywood (thanks to his consulting on a TV show as a detective no less). 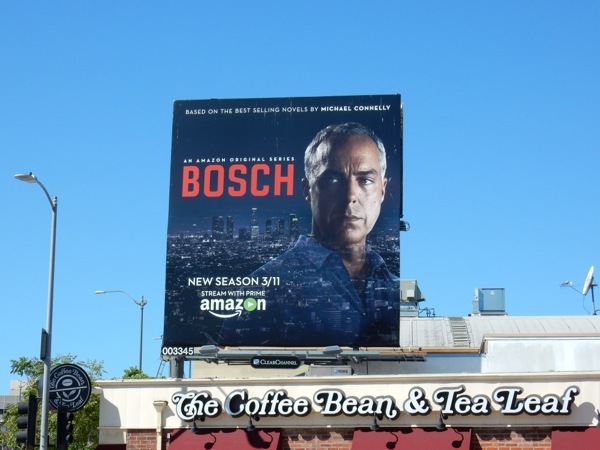 This ad creative with its reflective view of Downtown L.A. at night seems to be almost the perfect imagery for the returning jazz-loving LAPD detective (played with conviction by Titus Welliver), back for his sophomore season on Amazon. In this second season the L.A. noir adaptation will explore elements from stories from Trunk Music, The Drop and The Last Coyote and will see Harry re-open his mother's murder case, investigate the death of a Hollywood producer and help out his ex-wife and teenage daughter, plus follow a trail of corruption which will lead him to Las Vegas and back. 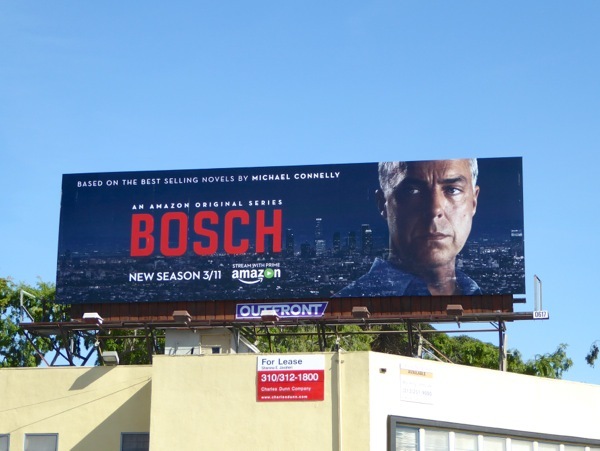 These season two billboards were spied along L.A.'s La Brea Avenue and Vine Street (which serendipitously has the DTLA city skyline in the background) from February 24 to February 27, 2016. 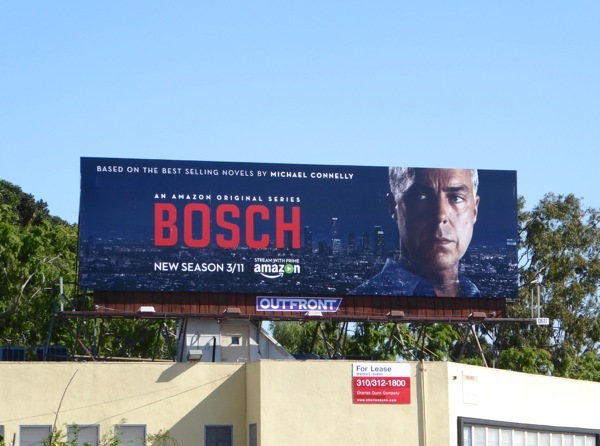 If you're a fan of the literary character brought to life on the small screen, be sure to also check to these Bosch season one billboards from around the skies of L.A. this time last year. 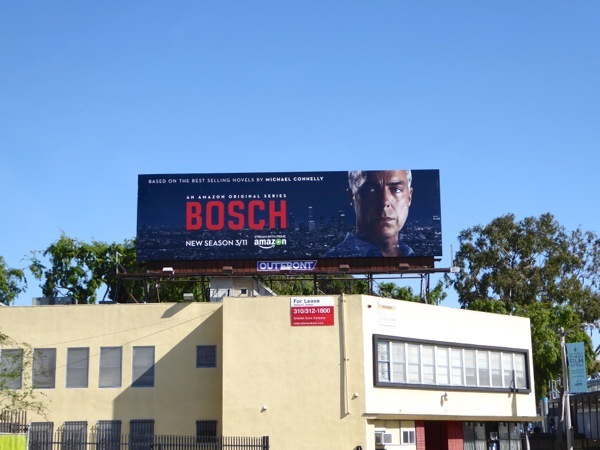 What crimes and dark secrets will Bosch uncover this season, get ready to binge-watch all ten new episodes to your heart's delight and find out. 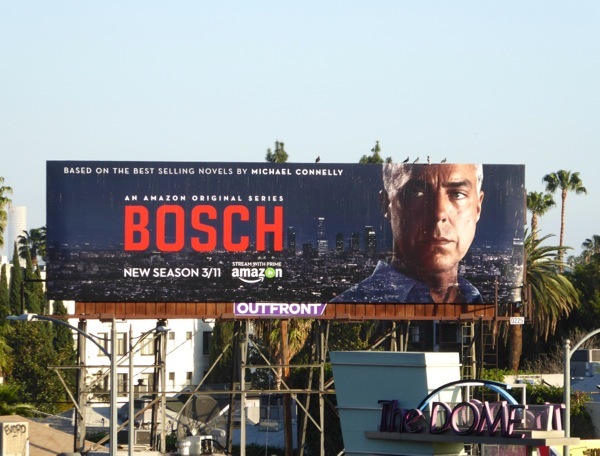 UPDATED: Here's another shape ad format for the second season of Bosch, which is brilliant by the way, spied at the busy intersection of Beverly Glen and Santa Monica Boulevards on April 16, 2016.